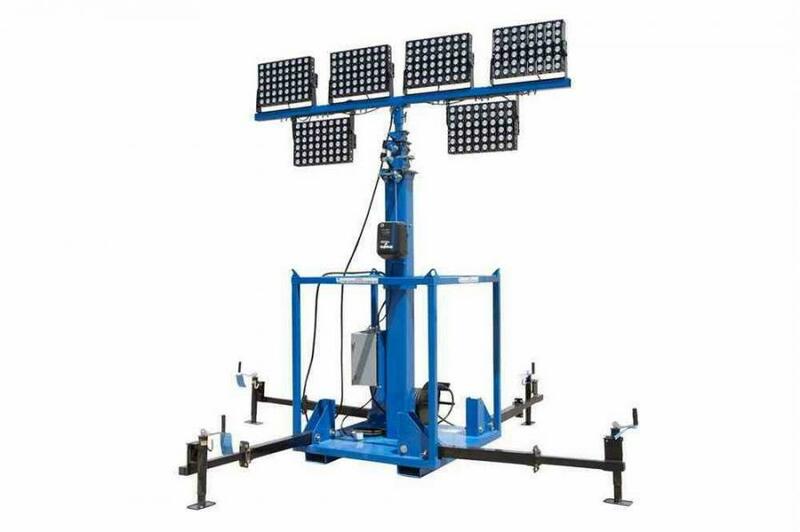 The LM-30-8-5S-6X600LTL-LED-EW-E18-SM-RD-TBC skid mount LED light plant features six high output, wet area approved LED fixtures producing a total of 360,000 lumens of light. Larson Electronics, a Texas-based company with more than 40 years of experience spearheading the industrial lighting sector, announced the release of a five-stage skid mount LED light plant that produces 360,000 lumens of intense LED light, drawing just 3,000 watts. This unit's light boom can be extended to 30 ft. and collapsed to 11 ft. and is made of square steel tubing. The mast is elevated using a 3,500 lb. electric, horizontally mounted winch with 3/16 in. galvanized braided cable. The LM-30-8-5S-6X600LTL-LED-EW-E18-SM-RD-TBC skid mount LED light plant features six high output, wet area approved LED fixtures producing a total of 360,000 lumens of light. Each light head has 48 Cree high output LEDs that produce 2,500 lumens of light each and are arranged in rows. These LEDs are paired with PMMA high purity optics to produce a focused 25 degree wide spot beam. Additional beam options include optics with a 10 degree spot, 38 degree narrow flood, 60 degree flood, and 90 degree wide flood beam spreads. Larson Electronics' five-stage LED light plant features individual heat sinks per bank of six LEDs to control heat buildup allowing for more thorough cooling of the bulbs for extending operating periods. These LEDs are IP67 rated and designed to withstand harsh conditions and rapid temperature changes of -40C to 80C. These LED fixtures are also waterproof and resistant to dust, dirt and humidity. The housings are made of sturdy die-cast aluminum and the optics are made of high transmission PMMA with 98 percent light transmittance. The Cree LEDs are rated at 70 percent lumen maintenance after 80,000 hours of use. The floodlights on this unit are attached to the light boom's mast head via adjustable trunnion U-brackets which add stability and allow the lights to be vertically adjusted 180 degree independently. Each LED light head features multiple LED drivers to help increase the operational life of the fixture. The mast is controlled via push-button controls mounted on the outside of the control box, housed within a NEMA 4X rated control panel. The LED flood light system is skid mounted and comes equipped with 200 ft. of 10/4 chemical and abrasion resistant SOOW cord fitted with an industrial grade cord cap. This LED flood light system is suitable for a variety of applications, including temporary lighting solutions, for use at construction sites, and for security camera deployment.